Ken with a custom piece, 1985. In addition to heirloom framed butterfly and other gift-lines and décor, The Butterfly Man® mark is also associated with original artwork as shown here, with flocks of butterflies in murals called “Butterfly Waves.” Each piece is made to order (see disclaimer), any color, any size. Limited editions are also offered every summer at the prestigious Sawdust Festival in Laguna Beach, CA. 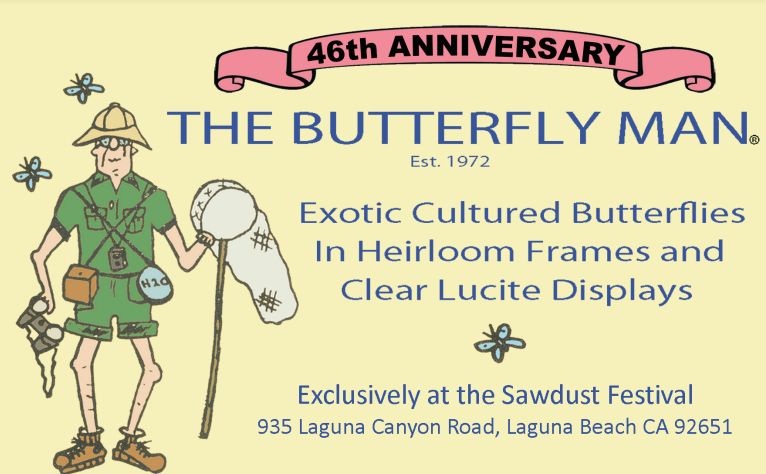 Established in 1972 under Ken Denton’s affiliate “Artistry in Nature,” The Butterfly Man® continues as a hallmark for quality original art, home decor, butterfly specimens, collection appraisals for donation or insurance, and master-level museum preparatory skills. Ken has donated thousands of butterflies to museums including The Smithsonian, D.C., the Los Angeles County Museum of Natural History, the Santa Barbara Museum of Natural History, and others, with new genus and species added to these fine collections. DISCLAIMER: Artwork may be seasonal and is therefore pro-forma. Please email ken@thebutterflyman.com or write: P.O. Box 906, Laguna Beach, CA 92652 before placing an order to assure availability, verify UPS packing & shipping costs, and lead times.